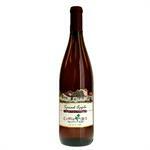 A sweet fruit wine that is spiced with cinnamon and a hint of clove. Try adding to pork and sauerkraut for a wonderful meal! A sweet spiced rosé that has flavors of cinnamon, cloves and citrus. Heat in the wintertime or mix with brown sugar for a wonderful ham glaze.